NYC, 03/09/2019, 1:00PM. A Matter of Chance . 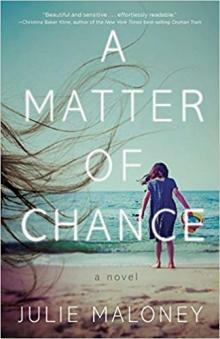 Julie Maloney will be present to talk on her new thriller A Matter of Chance. A Matter of Chance tells the story of an 8-year-old girl’s disappearance from a New Jersey shore town and her mother’s relentless search for her child. Research for the novel took Julie to Germany, where she visited the Kathe Kollwitz Museum, curator of the largest collection of work by the country's most revered artist— the muse for her story. Julie also had several interviews with a former undercover DEA agent from Brooklyn, who answered questions on the topic of underworld crime.